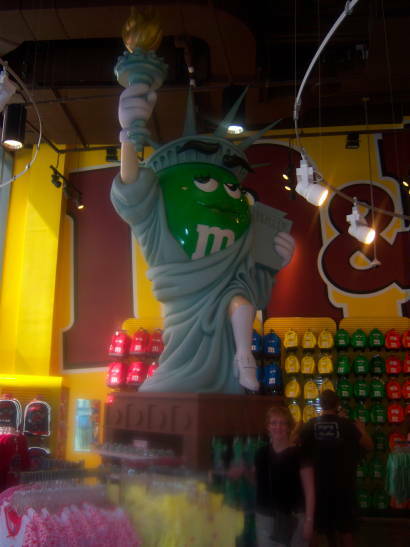 Six years ago I visited New York City for the first time. Deciding that I wanted to spend Thanksgiving and my birthday in this busy metropolis, we scheduled a four day trip. It didn’t disappoint but we weren’t able to find time for a big musical and Mike has regretted that. I decided to treat Mike (and me) to another visit. This time it was his birthday and we made sure the trip included a big musical. In fact, we actually saw two! We flew into Newark on a Friday evening, which proved to be a pleasant and rather inexpensive way to access the city. Packing lightly, we left the plane, to find a train and then a subway, which was one block from our hotel. The concierge recommended a delightful (and authentic) Italian restaurant around the corner. It was located in a basement with a piano bar. The owners painted rural scenes from Italia on the walls so that we seemed to look out at the country rather than a dark, dank cellar. I had homemade pasta that was just like Grandma used to make and tiramisu she did not, but it was one of the best I have ever had. Unfortunately in the heart of Manhattan we paid for this dearly. 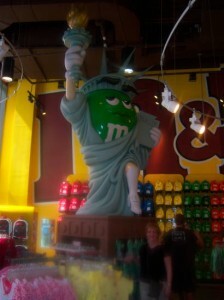 Saturday was theater day but not before a trip to M&M World, and a walk up and down Broadway to Times Square. Our first musical was a matinee at the Gershwin Theater, “Wicked”. I had only heard good reviews from friends and family who were able to see the production when it came to TPAC last year but I really didn’t know much about the story or music. It was one of the most amazing shows I have ever seen. Elphaba, aka “The Wicked Witch of the West” has her own story, one not seen in the original Oz movie but this version is brought to light by Glinda the Good Witch. Despite the lack of famous names involved in the show, the set was intricate, the music good, the acting great and I was overcome by the emotions that the production renders. Simply, I was verklempt! After the show, Mike made a phone call to a friend who lives in Manhattan for a pizza recommendation. Her choice was the same one we got the last time we visited New York – John’s Pizza. It is an old establishment that began in the lower East Side and spread. This one is located in a former church with four real wood burning ovens and the pizza is primo! That evening we went to the St. James Theater (coincidentally next door to John’s) and saw “An American Idiot.” Even though I only knew about seven of the “Green Day” songs in the show, it didn’t matter. An American Idiot is the story of three disillusioned teens who choose different paths to try to overcome the apathy of suburbia. The producers used the set as well as the actors and music to tell the tale. Filled with television sets embedded into the wall that flashed images and slogans, the audience is caught up in the frenzy that is An American Idiot. The beat and dancing kept us on the edge of our seats for the ninety minute (no intermission) show. Due the nature of the message, this is NOT a show for children. An after show piece of cheesecake brought an end to this marvelous day. On Sunday, we awoke tired and mellow from all of the previous day’s excitement and decided to let the day unfold with little planning. After breakfast we wandered uptown and found ourselves in front of St. Patrick’s Cathedral right as mass was beginning. It seemed like a sign so we went in and were very glad that we did. The priest was obviously used to a tourist congregation and preached accordingly. The only dent in the weekend was our final choice before heading back to Newark. We walked over to the Museum of Modern Art and after paying $30.00 each for a ticket discovered that the floors which contained most of the well known art work were all closed so we had to settle for little know (by us) work. 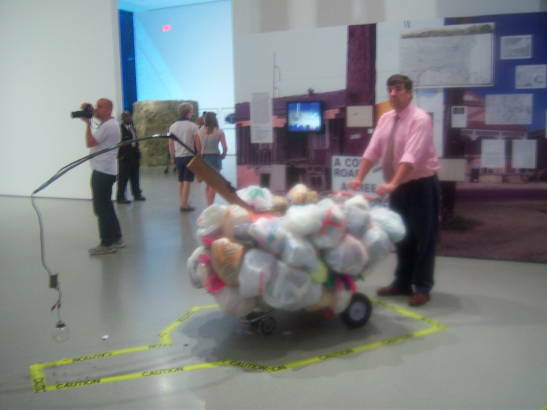 In the spirit of modern art we weren’t sure how we were supposed to appreciate a hay bale, walking stick and old shopping cart, each a display of art. New York City is not cheap. We traded in some points and got our hotel and one of the shows for free. The hotel (The Hilton Garden Inn Times Square) provided a free French breakfast each morning, since we were Hilton Honor members. That helped. New York City is always awake, noisy, and filled with people on a mission. You must plow ahead with your plan or you might suffer a sore arm as I did. Allowing people to get on the subway ahead of me (even though I had been there first) I almost didn’t make it on so pushed the door back open with my arm. If you put on you “New York State of Mind” when you arrive you will find much to see and appreciate. Spain was invaded by many different cultures. Evidence of this is in abundance so we scheduled a time to view the ancient wonders. Situated on the Mediterranean, offering lovely seaside views. is Peniscola and Tarragona, Spain. Peniscola has a castle that sets atop of the old part of the city surrounded by stone walls. Upward we climbed until we reached the top of the castle. It was a little too touristy for my nature. It is difficult to imagine days gone by when caterers arrive with bouquets of flowers intended for a wedding later that day but panoramic views of the sea abound. Tarragona proved to be the driving nightmare that we had begun to expect with Roman ruins setting amidst modern buildings. Our hotel was across the street from the coliseum where people continue to host modern entertainments. We walked around viewing thousand years old structures intertwined with a Spanish Elvis tribute band and eateries situated around and through the stone. What incongruousness! 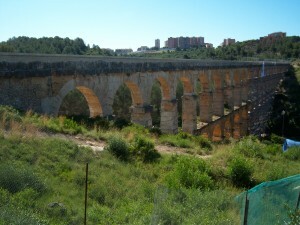 Fortunately we drove to a really great ruin of a Roman aqueduct several km outside of town and got to walk rather close up to the engineering wonder. Our final side trip was conducted through a tour group up to Montserrat. I am Roman Catholic, something that defines me as a person. We are not an evangelical people so my intent is not to convert but to explain. I went to the mountain enclave to see a bit of history, the goal of the tour guide. Tucked into the side of a mountain, (Montserrat means serrated mountain.) it is home to a Benedictine Monastery. According to legend in the 800s shepherds saw a light in a cave indicating the presence of the Holy Mother. During the 1200s a statue was carved in her honor. The Virgin of Montserrat is a black Madonna holding her child. Not able to move the statue the monks build around it. Today la Moreneta (“The little dark-skinned one”) is housed behind the alter in the Basilica. For hundreds of years, people have made pilgrimages to this holy place, asking for miracles. I knew little of this before we arrived and thus began our explorations at the gift shop. We then made our way to the Basilica where we found a long queue and decided to ignore our tour group and join the lines of waiting people. Our tour group was going to meet and then proceed to the Basilica where at 1:00 a boys choir would sing two songs, a tradition that began in the middle ages. The hour long wait allowed us time for prayer and contemplation, moving through thousand year old rooms with lovely alters and statues before we ascended the narrow staircase to the Madonna. The choir began to play adding to the specialness of the moment. Before me were two middle age Spanish ladies obviously prepared for this trip. Their eagerness shown through the language barrier. Each person is allowed a moment to honor the Virgin before moving on. These ladies were overcome and even peeked back into the room as I moved before the Holy Mother. As a Catholic, I need these reminders of God’s spiritualness and didn’t realize how truly filled with awe I would become. It was accident that I meandered into this queue not a tour stop destination but it provided one of the highlights of my trip. Our final side trip was conducted through a tour group up to Montserrat. I am Roman Catholic, something that defines me as a person. We are not an evangelical people so my intent is not to convert but to explain. 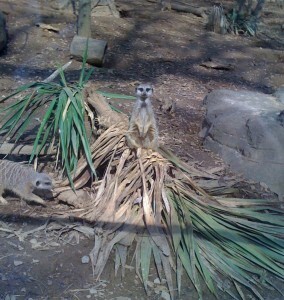 I went to the mountain enclave to see a bit of history, the goal of the tour guide. Tucked into the side of a mountain, (Montserrat means serrated mountain.) 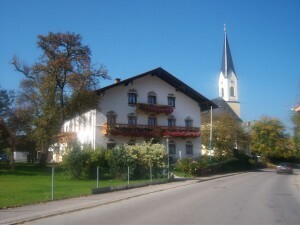 it is home to a Benedictine Monastery. According to legend in the 800s shepherds saw a light in a cave indicating the presence of the Holy Mother. During the 1200s a statue was carved in her honor. The Virgin of Montserrat is a black Madonna holding her child. Not able to move the statue the monks build around it. Today la Moreneta (“The little dark-skinned one”) is housed behind the alter in the Basilica. For hundreds of years, people have made pilgrimages to this holy place, asking for miracles. I knew little of this before we arrived and thus began our explorations at the gift shop. We then made our way to the Basilica where we found a long queue and decided to ignore our tour group and join the lines of waiting people. Our tour group was going to meet and then proceed to the Basilica where at 1:00 a boys choir would sing two songs, a tradition that began in the middle ages. The hour long wait allowed us time for prayer and contemplation, moving through thousand year old rooms with lovely alters and statues before we ascended the narrow staircase to the Madonna. The choir began to play adding to the specialness of the moment. Before me were two middle age Spanish ladies obviously prepared for this trip. Their eagerness shown through the language barrier. Each person is allowed a moment to honor the Virgin before moving on. These ladies were overcome and even peeked back into the room as I moved before the Holy Mother. As a Catholic, I need these reminders of God’s spiritualness and didn’t realize how truly filled with awe I would become. It was accident that I meandered into this queue not a tour stop destination but it provided one of the highlights of my trip. Spain was invaded by many different cultures. Evidence of this is in abundance so we scheduled a time to view the ancient wonders. Situated on the Mediterranean, offering lovely seaside views. is Peniscola and Tarragona, Spain. Peniscola has a castle that sets atop of the old part of the city surrounded by stone walls. Upward we climbed until we reached the top of the castle. It was a little too touristy for my nature. It is difficult to imagine days gone by when caterers arrive with bouquets of flowers intended for a wedding later that day but panoramic views of the sea abound. Tarragona proved to be the driving nightmare that we had begun to expect with Roman ruins setting amidst modern buildings. Our hotel was across the street from the coliseum where people continue to host modern entertainments. We walked around viewing thousand years old structures intertwined with a Spanish Elvis tribute band and eateries situated around and through the stone. What incongruousness! Our final side trip was conducted through a tour group up to Montserrat. I am Roman Catholic, something that defines me as a person. We are not an evangelical people so my intent is not to convert but to explain. I went to the mountain enclave to see a bit of history, the goal of the tour guide. Tucked into the side of a mountain, (Montserrat means serrated mountain.) it is home to a Benedictine Monastery. According to legend in the 800s shepherds saw a light in a cave indicating the presence of the Holy Mother. During the 1200s a statue was carved in her honor. The Virgin of Montserrat is a black Madonna holding her child. Not able to move the statue the monks build around it. Today la Moreneta (“The little dark-skinned one”) is housed behind the alter in the Basilica. For hundreds of years, people have made pilgrimages to this holy place, asking for miracles. I knew little of this before we arrived and thus began our explorations at the gift shop. We then made our way to the Basilica where we found a long queue and decided to ignore our tour group and join the lines of waiting people. Our tour group was going to meet and then proceed to the Basilica where at 1:00 a boys choir would sing two songs, a tradition that began in the middle ages. The hour long wait allowed us time for prayer and contemplation, moving through thousand year old rooms with lovely alters and statues before we ascended the narrow staircase to the Madonna. The choir began to play adding to the specialness of the moment. Before me were two middle age Spanish ladies obviously prepared for this trip. Their eagerness shown through the language barrier. Each person is allowed a moment to honor the Virgin before moving on. These ladies were overcome and even peeked back into the room as I moved before the Holy Mother. As a Catholic, I need these reminders of God’s wonders and didn’t realize how truly filled with awe I would become. It was accident that I meandered into this queue not a tour stop destination but it provided one of the highlights of my trip. 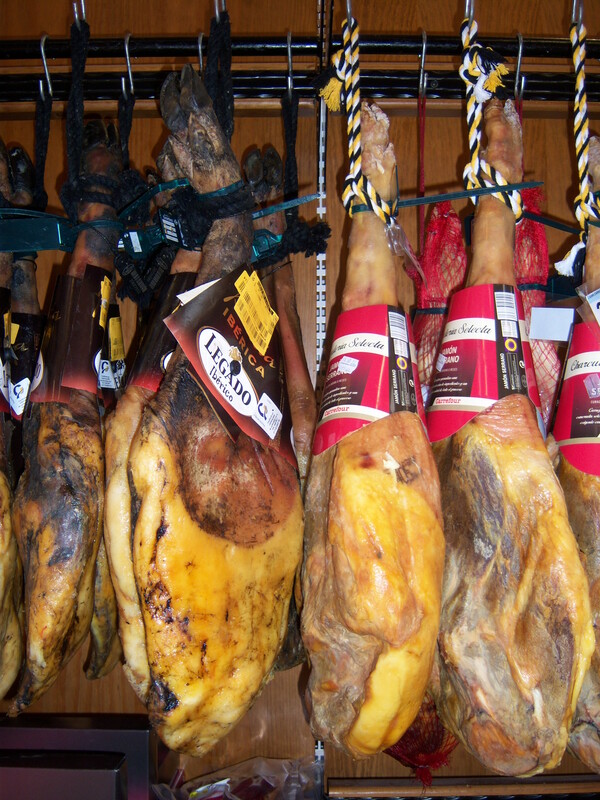 Spain was invaded by many different cultures. Evidence of this is in abundance so we scheduled a time to view the ancient wonders. Situated on the Mediterranean, offering lovely seaside views. 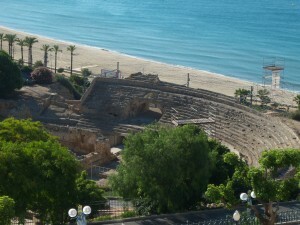 is Peniscola and Tarragona, Spain. Peniscola has a castle that sets atop of the old part of the city surrounded by stone walls. Upward we climbed until we reached the top of the castle. It was a little too touristy for my nature. It is difficult to imagine days gone by when caterers arrive with bouquets of flowers intended for a wedding later that day but panoramic views of the sea abound. The next trip took place with Garmin firmly planted on the front window. 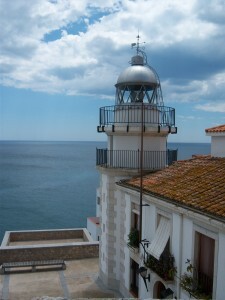 The destination was Xativa (pronounced Sha-ti-va). We arrived with no problems to a medieval town with one lane, one way streets. Miss Garmin was misinformed on this information so we were on our own again to locate the Castile. Mike was given an opportunity to show off his driving skills as we went up and back down the wandering (or as the travel book said, “higgledy-piggledy”) “ maze that is the historic district finally lucking up on the path to the Castile. After parking the rest of the afternoon was spend mostly climbing up. 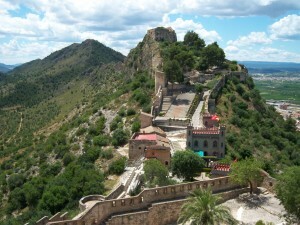 Spanish castles (maybe others, I am not an authority) are situated at the top of mountains. We climbed the smaller one first and found out that Hannibal had stayed there. His wife even had her own room where she gave birth to a child. It is truly emotional to realize that you are standing on history. More so for me, when it comes off the beaten path and not a touristy area like the Coliseum for example. Unfortunately he left no elephants behind. They would have proven useful for the further walking. But it was worth it. The panoramic views were inspiring and left us with renewed appreciation for the land and life in castles. 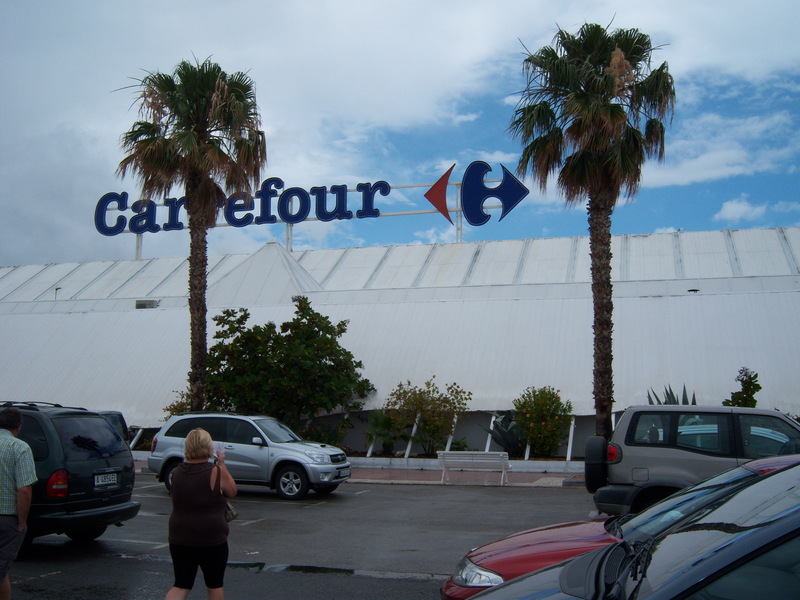 We completed our day trips of the Costa Blanca region with a trip to Alcoi. Up windy roads for about sixty minutes we arrived to a rather large city situated among the mountains. Known for its sugared almonds and tiled buildings, we saw neither. A few pictures and a dang good gelato later, we decided to give it up and head on back. The loveliness of this city missed us or we just couldn’t find it. Travel books can only do so much. Onward tomorrow to the province of Roman ruins. Feet attached to the the hams. We are home-based in Albir, Spain, a small town by the Mediterranean. The pebble beach is a vacation spot for many northern Europeans making this a beautiful place to stay for the view but our days will be spent taking trips in the opposite direction. I really don’t enjoy “relaxing” on a beach and would rather venture out to look for history , culture and nature. We rented a car in Barcelona – a Citroen Picasso. I love it! It is a small, cute, station wagon; easy to drive BUT the rental place decided that I did not request a GPS (I did) and we are without. This has made most trips twice as long as they should be. Tomorrow we are going to the local superstore and try to purchase one. Spanish highways and street signs are not always easy to see. You can make few left turns and most locals do not speak English. 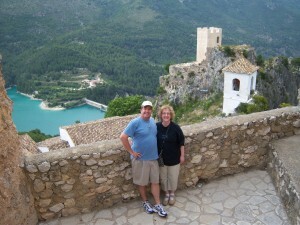 Taking a cue from the literature on paid tours, we traveled on our first day to Jalon, a place known for its vineyards. Up a steep mountain road we went, oohing and ahhing, until we located the small town. It has one vineyard that is closed on Sunday. Oh well, I suggested we sit down at a lovely grape leaf (real ones) adorned bar and enjoy some Sangria. Not being a Sangria expert I didn’t realized the punch would come in large pitcher. I thought the waitress was mistaken when she brought it to me. She was also surprised that I was not part a of a large party and suggested that we order some food. She didn’t think that much wine on an empty stomach was a good thing and we agreed. Soon plates of meats, cheeses, olives and tomatoes arrived with a basket of bread. We were delighted. Couldn’t finish the drink but the food was good and the conversation with the Dutch people beside of us made for an entertaining afternoon. The next day we ventured up another mountain to the small town of Guadelest. 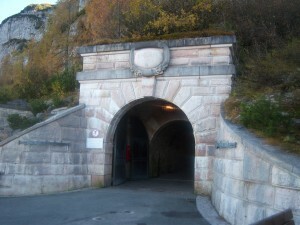 You must walk up and through a short tunnel to enter the old part. In that section is a 17th century home that has steps which will lead you out to a castle built in the 13th century. Unfortunately earthquakes have made the castle mostly ruins but you can see the valley below which overlooks Lake Guadelest, an azure blue lake. I have only seen this color artificially, never for real and am sure that my photographs will not do it justice. A torrent of rain held bay until the last souvenir was purchased and we dashed back down the hill to eat at a recommended, privately own restaurant. The waitress allowed us to go out to a closed in deck so we were able to view the castle while dining and enjoyed a carefully prepared late lunch (or early dinner) depending on your cultural preferences. The gazpacho was divine, creamy, and seasoned with just the right amount of olive oil and salt. We finally found the correct and most direct route back which also included an orange stand. Our unit has an electric juicer and I want to make fresh juice. I also purchased some chocolate soap which I hope will make me smell delicious. It doesn’t get dark until about ten o’clock allowing enough time to relax, read and swim, not necessarily in that order. This was my third trip to the eternal city, which is quickly becoming one of my favorite places to visit. While the attitude of the people can be trying to Americans I find that if I drink, relax and take in the atmosphere, it is a very special place indeed. Where else can you go just to eat!! The food is delicious. I can honestly say that I have never had a bad meal in Italy. I chose to eat simply this time and discovered some of the best spaghetti and lasagna I have ever tasted. That combined with wonderful wine, fresh bread, hot cappuccinos, yummy pastries and gelato made us jump out of bed each day to savor the delights. Two new attractions for this trip included Palatine Hill and The Cat Sanctuary. A very likable tour guide led us through the rain to discover the lifestyle of ancient Roman emperors. It was raining and we walked uphill a lot but there is nothing like happening upon the place where legend says Romulus set up his hut beginning three thousand years of everything life can throw at you. The panoramic views of the city make the tour worth it. Being a lover of animals the cat sanctuary was a unique experience. 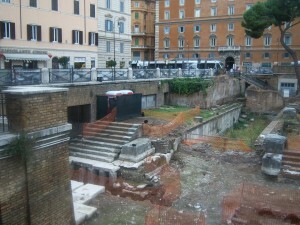 A short walk from the Pantheon, sunken ruins are home to about 250 cats. Unpaid volunteers rely on the charity to neuter, vaccinate and provide food and plenty of love to felines that have been discarded by others. They take in sick and injured cats providing them with the care they need to flourish. The cats enjoy your attention and the volunteers love to share the history of the place and will take time to show you around. All of this is free but just seeing their dedication makes you want to leave a donation. The four days spent here went by much too fast but a few suggestions. I will never fly Alitalia again. The airlines is much like the country – somewhat dirty, laid back and noisy. After flight delays that resulted in connections problems, I will choose a more reliable airline in the future. 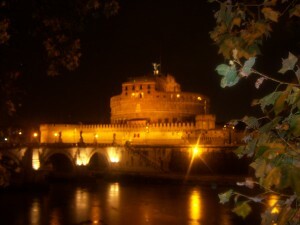 We stayed at Hotel Raffaello, a lovely boutique hotel between the Termini and the Colosseo. The room was European small but very clean. Breakfast is provided with many choices – cereals, eggs, meats, cheeses, yogurts, fresh fruit, pastries, cakes and bread as well as coffee, tea, juice and hot chocolate. There is Internet access (5 euros for 2 hours) in the lobby. The metro is two blocks from the hotel which is located by many restaurants, bars and groceries. I came here to spend time with Mike during my Fall Break. The beach is just lovely, my favorite yet for the panhandle region. The sand is very white and mostly free of people during this time of the year. We stayed at the Hampton Inn, very nice for a modest hotel. Got a good view of the gulf with a balcony room. The strip is filled with places to eat, mostly fish but you can’t go hungry. If you want to hear Jimmy Buffett music or anything from the sixties this is the place to be. Live bands can be found in most places especially on the weekend. Side walks make it nice for jogging but remember to bring extra water as the weather is extremely humid.